June 26 – June 29 2015, Denmark. 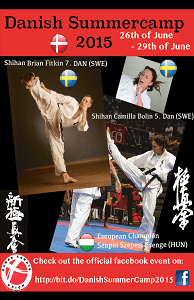 The danish Summer camp brought to you by the Danish Karate Union – Shinkyokushin. The Danish Camps has always been at the highest quality, and this year will be no exception! And of course the Danish top instructors! We can only highly recommend this camp, and assure you that this camp has everything what a camp should have! Click poster for Facebook page, and full info!